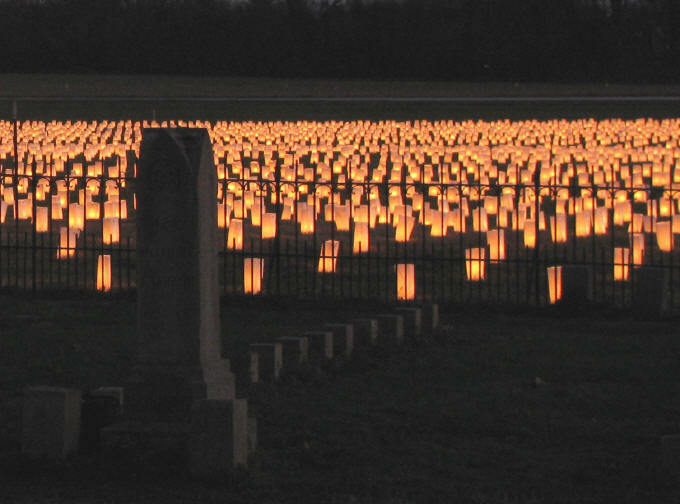 A ten thousand candle Illumination was staged near the Confederate Cemetery to commemorate the nearly 10,000 casualties suffered by both sides during the Battle of Franklin November 30, 1864. This is the fourth year that this commemorative event has been held, and it was held during the Blue & Gray Days weekend program sponsored by the Carter House and Carnton Plantation. A short commemorative program near the Cemetery featured Thomas Flagel and Eric Jacobson recounting the horrific battle and its terrible aftermath. The 8th Regimental Georgia Brass Band then performed a concert of northern and southern songs and closed with several songs of reconciliation. A crowd of nearly 1,000 attended this very moving program. 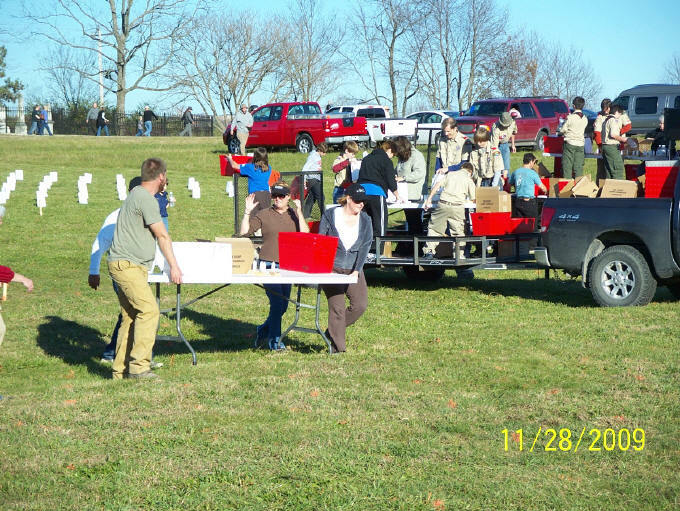 The Illumination was sponsored and organized by the Franklin Battlefield Task Force with much assistance from the Franklin Parks Department. 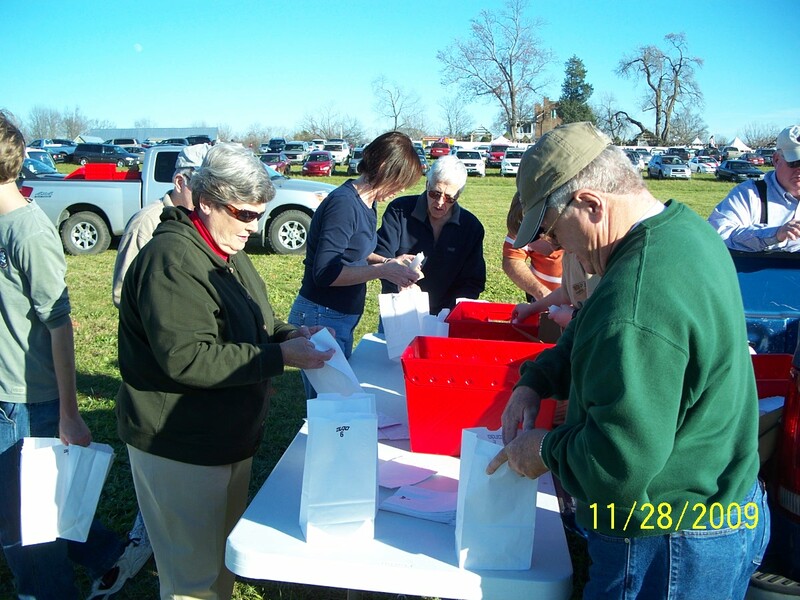 The Task Force has members from STFB, Carter House, Carnton, Heritage Foundation and other local groups and volunteers, and relies on them for planning and conducting the display. 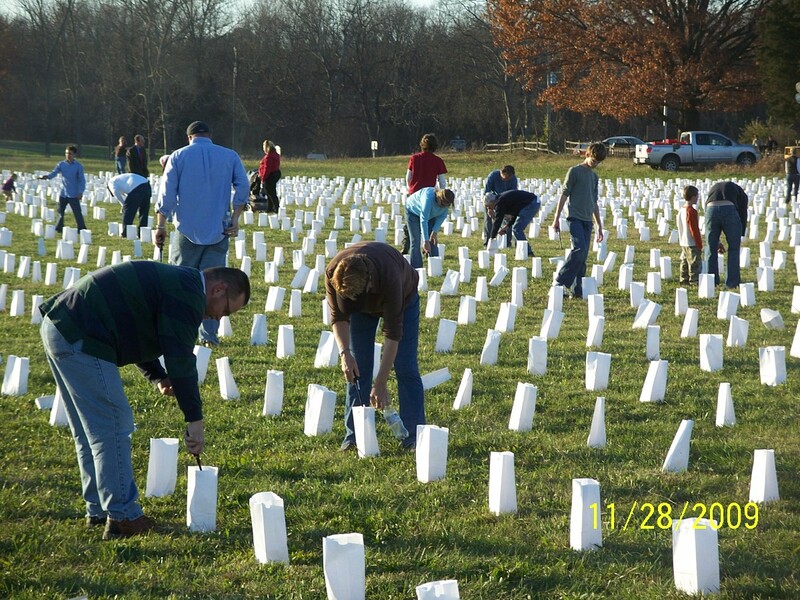 A few hundred of the 10,000 luminaries were given to the hospital sites around town where their owners arranged street-side Illuminations to coincide with the main event at the Confederate Cemetery. The display covered nearly four acres of the battlefield south of the cemetery and featured a design of a large outline star in the center. The visual effect of the rank and file arrangement of the luminaries was spectacular. Aerial photos of the display were made by Snap Roll Aerial Photography and can be seen at their web site. This year, the event’s organizers used wooden candle blocks in the bags in place of sand. This innovation reduced the volunteer hours needed to assemble and place the display by more than half. The blocks were kept for use in future years. The ceremony attracted many visitors who just happened to be in town. In future years, the event may become a regular annual project to commemorate and honor those who suffered here, and to educate our visiting public. Silhouetted soldiers standing at attention during the ceremony.